Need Front or Rear Parking Sensors installed in Essex? In Car Advancements fit a huge range of parking sensors from world leading brands like Steelmate and Cobra and Parksafe. 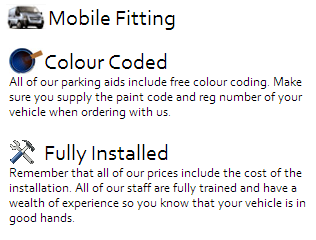 All our kits come with a long warranty and if you require them to be colour matched to your car (colour coded) we have them sprayed in a body shop where the paint is a perfect match to your vehicles colour and the finish will last for years, If you don’t have sensors correctly colour coded to your vehicle the paint could start to become damaged and crack. That is why we pride ourselves on the best parking sensor products and the very best colour matching service. We are fully insured to work on your vehicle and have been fitting parking sensors for many years, All measurements are triple checked before drilling and they are correctly placed in the bumper to give the best protection possible. We try our best to use the factory fitting positions to give the best original appearance possible. We can even fit angled collars if the vehicle is very low to the ground to make sure there is no chance of it picking up the ground on a flat surface. All the kits we supply and install are programmable if the vehicle has a tow bar fitted, This will then cancel out the towing ball and will add an extra 20cm’s on the sensors range. We would not suggest flush mount sensors for every type of vehicle due to flush mount sensors having no angle on them as standard this means if they are mounted below 45cm they could detect the ground when reversing. If you only want flush mount sensors fitted even though they will be low to the ground we can custom program the box to make sure they will work perfect. Another downside to flush mount sensors is the bumper needs to be fully removed and some people don’t like the idea of fully removing the bumper, in this case we would suggest having regular clip in type sensors installed. Our sensors come standard with a buzzer some kits can have a buzzer which can change the tone and the volume can also be adjusted to allow total control. But a display can be added if you wish we offer roof mounting types and the dash displays which can be installed to give an original equipment look. We offer a wide range of reversing cameras which can aid reversing much better over parking sensors as you can see the main reversing path behind you without listening to a buzzer. We do a range of vehicle fit reversing cameras which make the vehicle look like it come with it fitted as standard. These types of camera’s are normally mounted in the number plate light. Most kits can be run through the dash boards multimedia system or a LCD mirror which looks very smart.